Kittens are more likely to get colic than older cats. Sometimes your kitty's tummy just can't cope with food. Like any baby, her digestive system isn't working at full power and some foods aggravate it to produce tummy pains. If she's got colic you'll probably notice her rolling around in agony -- if she was a baby, she'd cry. You'll rarely hear of an adult having colic, but you wouldn't be surprised if a baby had it. It's the same with cats. If your furball is still in the kitten stage, then she's more susceptible to getting colic. Basically, colic is a severe stomach pain caused by a buildup of gas in the abdomen. Judging by the way babies cry with colic the pain is excruciating, and you can assume your little kitty is suffering a similar agony. Signs to watch out for include arching her back while tucking her front feet in, a swollen tummy, lack of appetite, restlessness and thrashing around on the floor. There are external or internal causes of the disease. External causes include feeding your kitty food that doesn't suit her, or she gets hold of spoiled food outside. Consuming poisons of any kind, such as household detergent or pesticides, are another cause. Internal causes include bacterial or viral infections, kidney and liver diseases or bowel and pancreas problems. Obviously, you wouldn't want your furry friend to suffer any longer than necessary, so you'll want to get her pain relief pronto. You should get your pet to the vet quickly if you suspect she has colic, especially if she's if she's still at the kitten stage when it's more serious. It isn't usually a life-threatening condition, but it should never be left untreated or it can lead to collapse. Diagnosis usually includes a full blood count plus a urine and biochemical analysis. An X-ray and endoscopy investigation may be necessary if the biochemical tests are inconclusive. The treatment your vet suggests really depends on the severity of your furry friend's colic. Typical treatments include antacids and electrolytes, but if your kitty's symptoms are mild she may respond well just to a day without food followed by a bland diet such as chicken and rice. Veterinarian Dan Rice warns against treating your furball with home remedies without getting a veterinary diagnosis first. Remedies that suit older cats may be toxic for younger ones. Once you've consulted your vet about your kitty's colic, you may want to use some herbal remedies to help her. Chamomile tea helps with mild cases, just as it does with people's digestive problems. The suggested dosage in "Veterinary Herbal Medicine" is 1 teaspoon to 1 tablespoon every 30 minutes until the spasms ease. Holistic vets might prescribe a combination of herbs, including fennel, licorice, cramp bark and chamomile. What Does It Mean When a Cat Burps Often? 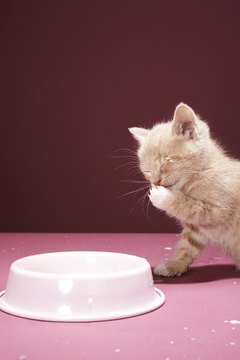 What Is Centrine Prescribed for in Kittens? What Happens to a Fur Ball if a Cat Does Not Cough It Up?